Earlier this month, Tumblr rolled out its first attempt at making money: a small ($9) fee to make your blog featured in a directory of blogs. Tomorrow, the service is officially rolling out its second revenue generator: premium themes. The initial 13 themes being featured in this roll-out look pretty great. They come from 7 different designers and will range in price from $9 all the way up to $49. Tumblr declined to give the revenue split between the company and the designers but says that “most” of the money will go to the designers. The premium themes page is actually already live here. This seems like a smart play for Tumblr. One thing that separates it from rivals such as Posterous is the attention to design. 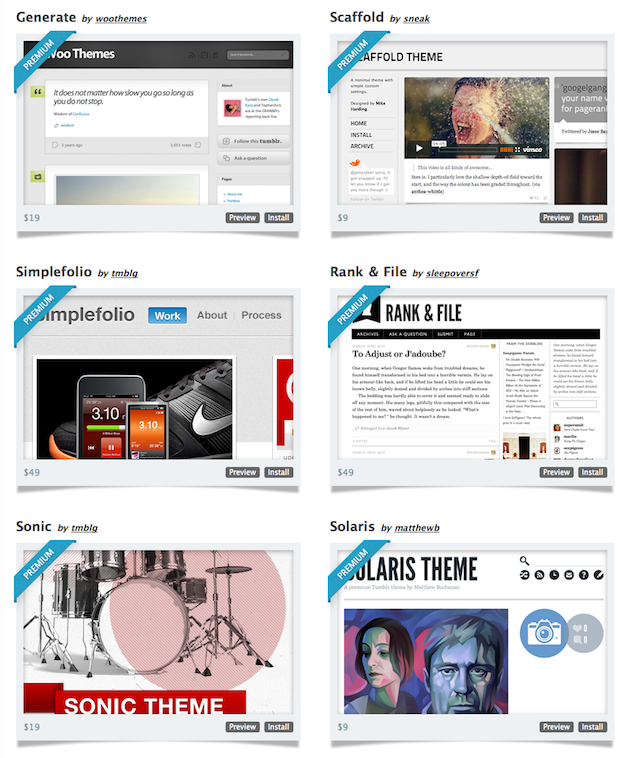 Tumblr already features over 350 free templates that any user can install with the click of a button. “There’s already been a ton of demand for this platform [premium designs] from our developer community, and we know it will add a spectacular collection of new themes and options for our bloggers,” says founder David Karp. The roll out of this second premium feature is the latest in a huge amount of updates the service has unveiled in the past several weeks. Those include the ability to add static pages to Tumblr blogs, photo replies, video uploads, and even comments (sort of). Tumblr is also just about to hit 4 million users.